In Kahmaté, two teams compete in the field. They have the same number of players: 6 well-trained rugby players, each with their own speciality.... The strong man: the strong man of the team. Fearing for his tackles and raffuts, it is better not to be in his way. The fast one: the team's rocket. Be careful, this one has legs and he knows how to use them! Avoid leaving the balloon too long and protect your wings well otherwise, it is the guaranteed test. The tough one: the team's furious. The attack phases are his specialty. Watch out for his tackles! The agile: the team's bee. Once the ball is in his hands, it is difficult to take it back. Don't give him too much room for manoeuvre... The basic players: the team's backbone. They provide safe and effective support to the rest of the group. You can always count on them. No more mud under the shoes, but sweat on the forehead. 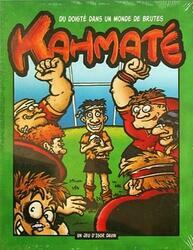 Kahmaté is a face-to-face battle between two rugby captains. On the field, lead your team of six rugby players to score a try at your opponent. Sharpen the weakest, prevent the strongest from having the ball for too long and think about playing together, in the spirit of rugby! More intense effort, but strategic cramps. In this board game, there is no place for chance. The most skilled strategist wins. Manage your team's endurance and try bluffing to weaken the opposing team. Place your players skillfully, block the progress of opposing players. Grab the ball and send your wingman flattening into the end zone. No more dehydration, but a game of aperitifs. Kahmaté therefore offers a game of rugby on stage in a relaxed atmosphere. Play and enjoy your victory with a drink in hand!